Make sure you are using v5.1 starting today and delete all old version from your computer. Make sure you are using v5.0 starting today and delete all old version from your computer. Make sure you are using v4.0 starting today and delete all old version from your computer. This client will not take credit in case of Unlock Unsucessful so you can try multiple times to unlock the same phone in case of communication error. It nearly always unlocks on second attempt so this should be ok. Make sure you are using v3.5 starting today and delete all old version from your computer. 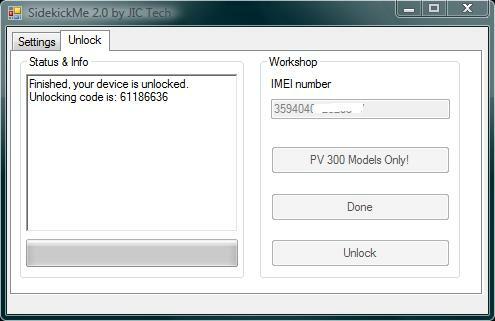 We also add the SideKick PV100 to the list of supported model for IMEI Unlock ! To order just go to “Cable Unlock” section of your UnlockBase account and select the tool “SideKick PV300 Unlock Server” you will receive in real time (Instant) the username and password with 1 Credits to Unlock a SideKick PV300 ! It’s fast, and very easy…. No License Key or boring process. Enjoy it ! 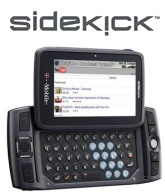 The next official SideKick submission day is the Thursday 8th July 2010, expected date for delivery one week later. 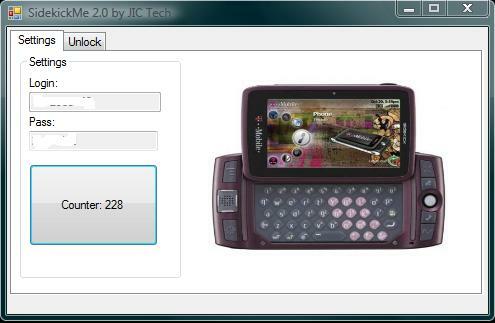 We remind it is not possible to cancel a request of code on SideKick Factory Code after the submission day ! The next official SideKick submission day is the Thursday 24th June 2010, expected date for delivery one week later. We remind it is not possible to cancel a request of code on SideKick Factory Code after the submission day !